Business Plan. 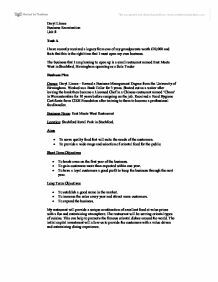 The business that I am planning to open up is a small restaurant named East Meets West in Stechford, Birmingham operating as a Sole Trader Business. Task A I have recently received a legacy from one of my grandparents worth �10,000 and feels that this is the right time that I must open my own business. 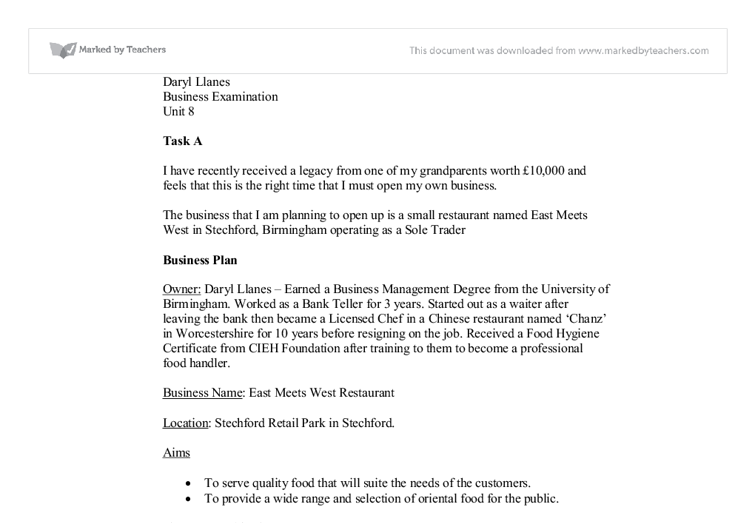 The business that I am planning to open up is a small restaurant named East Meets West in Stechford, Birmingham operating as a Sole Trader Business Plan Owner: Daryl Llanes - Earned a Business Management Degree from the University of Birmingham. Worked as a Bank Teller for 3 years. Started out as a waiter after leaving the bank then became a Licensed Chef in a Chinese restaurant named 'Chanz' in Worcestershire for 10 years before resigning on the job. Received a Food Hygiene Certificate from CIEH Foundation after training to them to become a professional food handler. Business Name: East Meets West Restaurant Location: Stechford Retail Park in Stechford. Aims * To serve quality food that will suite the needs of the customers. * To provide a wide range and selection of oriental food for the public. Short Term Objectives * To break even on the first year of the business. * To gain customers more than expected within one year. * To have a loyal customers a good profit to keep the business through the next year. Long Term Objectives * To establish a good name in the market. * To increase the sales every year and attract more customers. * To expand the business. My restaurant will provide a unique combination of excellent food at value prices with a fun and entertaining atmosphere. The restaurant will be serving oriental types of cuisine. This can help to promote the famous oriental dishes around the world. The initial capital investment will allow us to provide the customers with a value driven and entertaining dining experience. Market Research (Primary and Secondary) My business is faced with exciting opportunity of introducing oriental food and cuisines. ...read more. * If I want to change or upgrade the asset, I can sell the existing one but the proceeds may be less than the outlay in purchasing it. Source: www.businesslink.gov.uk SWOT SWOT Analysis is an effective way of identifying the business' Strengths and Weaknesses, and of examining the Opportunities and Threats it face. Strengths * Lower price point for a complete meal. * Speed of service will be instant. No long waiting for the food, salad beverage or dessert. Everything will be readily available: hot, juicy, fresh and cooked as requested. * Customers will choose from over 30-40 dishes prepared daily. It is often difficult to meet the dining requests of each family member due to individual tastes. But they can choose any kind of food from the selection that will suit their taste. * We will serve better quality food than our competitors. * Our surroundings will be more entertaining than our competitors e.g. cooking infront of the customers, sound system connected to a jukebox. * Strong relationships with vendors that offer high quality ingredients and fast frequent delivery schedules. * Excellent staff who are highly trained and very customer attentive. * High customer loyalty among repeat customers. * High quality food offerings that exceed competitors' offerings in quality, presentation and price. Weaknesses * Foods in other restaurants are much cheaper than East Meets West. However, we can guarantee the good service and quality of the restaurant. * Not enough budget to advertise that much. The business can only do simple advertisements. * A limited marketing budget to develop brand awareness. * The struggle to continually appear to be cutting edge. Opportunities * To expand the business in the near future. * To have a good name in the market. * Increasing sales opportunities in take out business. * The ability to spread overhead over multiple revenue centres. The business will be able to spread the management overhead costs among the multiple stores, decreasing the fixed costs per store. ...read more. Sales Promotion - I am planning to offer some good promotions to my customers to earn their loyalty. Every end of the month, customers can have a free set of meal when they order food worth �20 and up. This is a good incentive because it is attractive to them. Public Relations - I can advertise locally on the newspaper so people will be more familiar on my restaurant. Newspaper advertisement is a very effective way of promoting because all people read newspaper. Sponsorship - this is an expensive form of promotion and not much included on my business promotion. However, my restaurant can sponsor for charity works, small football teams and events that wants to be sponsored. This can also increase the familiarity of people. Competition There is only one major competition around the premises, the McDonald's Restaurant. This could be a threat to my business in some ways because of the food that they are serving in very affordable prices. However, I can say that their food is not healthy because of high fat like burgers and fries that are risky for the health of the customers. Competitive Strategy There are three major ways in which we will create an advantage over our competitors; * product identity, quality, and novelty * high employee motivation and good sales attitude * innovative and aggressive service options. Veggie Dishes Asparagus caesar salad �6.75 Organic purple bittersweet salad �6.50 Mixed leaves & herb salad �4.50 Organic puy lentil torte �13.25 Parmesan & nettle polpetta �12.95 Aubergine ganmodoki tempura �12.25 Chef salad �10.25 Pasta of the day �9.50 Organic lemon meringue tower �7.25 Cocoa �clair �6.95 Blueberry piroshki �6.75 Organic brie �6.50 My restaurant will be focusing the entire menu on healthy, low-fat cooking. Each of the competitors offers at least one "healthy" selection on their menu. The target market will perceive my restaurant as the destination location for healthy, low-fat cooking. We will be offering menu for those people who are vegetarians and health conscious. ?? ?? ?? ?? Daryl Llanes Business Examination Unit 8 ...read more. But after a few months later, a number of customers will increase recently throughout a year. Market research conducted: Primary research: I will collect some data from my customer and surrounding peoples by doing a survey of questionnaire. I also, ask some professional cleaner about their business and how they run their own business. As the operations in its inbound and outbound logistics improve, the company will expect significant savings and reduction of costs in the operations. Environmental factors are also considerable problems. The social responsibilities of McDonald's on the country are influential to the operations of the company. Most cultures aim to have a society that does not inflict pain or harm on anyone. There are many cultures that do not have an emphasis on religion where as some do. Countries such as Bangladesh do strain religion upon all those living in the society. aims, SWOT analysis is likely to be most detailed in a written format Offering competitive insight: Tesco plc manger may offer competitive insight to their staff so they are aware of the tactics that they can use in order to beat their competitors in the region in which they are falling behind, e.g. making improvement to ensure customers receive the best possible shopping experience SMART Objective : Tesco should grow sales by 5% by 2013 as last year they showed a slight decrease in sales due to high petrol prices. (this is supported by the new stores performance).